Mondain is the horse in the foreground above, the silver dappled horse on the right. I’ve been stalking this horse for the better part of a decade. In the flotsam and jetsam of my father’s office was the photograph above, framed by Lew decades before. It’s the only photo of the horse that I have. It was taken in what was called the “Mulberry Grove” that Great-Great-Grandfather George Thomas Galloway started planting on his homestead in 1881. On the back of the photo in pencil was Lew’s handwriting, “Old Dain”. 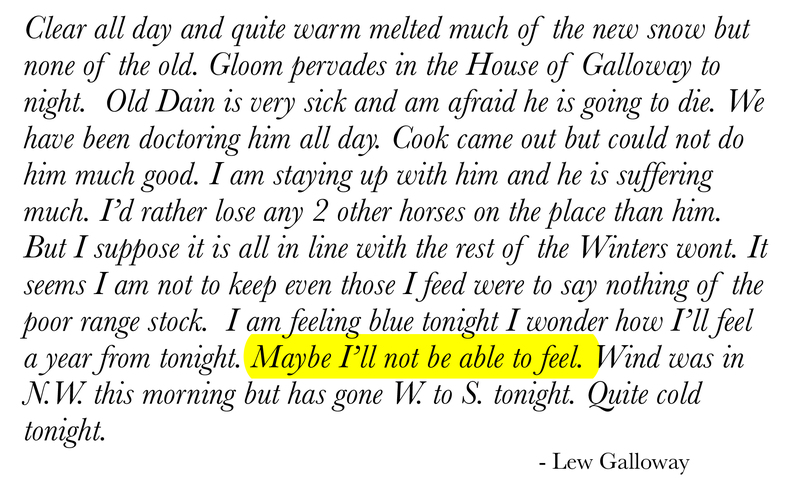 Lew wrote about the horse in his 1912 diary. Over the years I have scoured out-of-print books, scanned books and registries available in the internet, railroad schedules and US Census and State of Kansas census records from the years 1880-1915. I’ve visited state and county historical societies. I have gone through hundreds of yards of microfilm and microfische, pouring through 6 different newspapers, reading the news and classifieds from the years 1883 to 1912 in the states of Kansas and Illinois. I still only have the one photo. Using 125 year old train schedules and studying major routes of livestock and goods transported west from the Mississippi River, a most likely route of passage to western Kansas was determined. “Their horses are a part of their inheritance, particularly prized and accustomed to the affectionate attention of the entire household. Their docility, growing out of their intimate human relationship, is therefore an inborn trait“. They are an old breed of French draft horse that were very popular as imported stock into the US and Canada, from before the second industrial revolution and the expansion of the railroad to end the of World War 2, when their numbers in the US began to decline. Importation of the breed began in 1839. In the 1880’s, more than 5,000 Percheron stallions were imported to North America (2). Prior to the railroad expansion to the West, they along with Clydesdale horses were the primary workhorses and catalysts for the westward expansion of the United States. They were shipped BY rail to territories west of the Mississippi, and used for farming and general labor in industrial cities as they literally provided the horsepower that Manifest Destiny required. In the 1930 US Census, 70% of the draft horses in the US were of Percheron lineage, and more than 10,000 Percherons a year were imported into the US through the 1950’s. 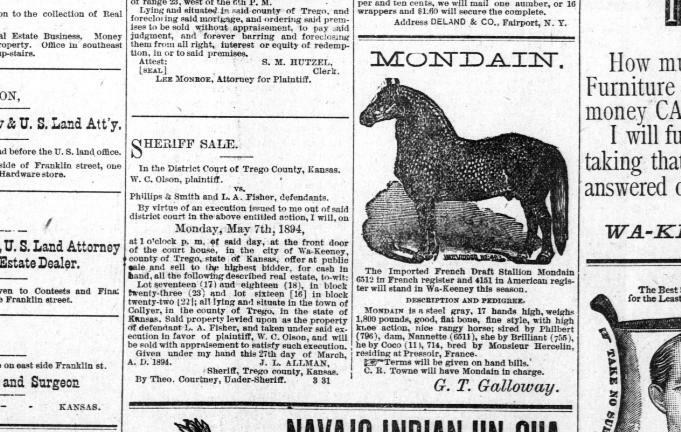 Mondain was one of 16 horses imported from France by the company that year. The Brown County Importing and Breeding company was one of the largest importers of draft horses in the United States at that time, as development along the Mississippi River increased. Mt. Sterling is 200 miles from Quincy, Illinois where George lived prior to 1879 when he emigrated to Trego County, Kansas. Cover (left), Horse identifier (middle) and Importing company schedule for 1886-1888. George bought the horse between 1886 after the horse was brought by steamship from France, and the year 1891, though I do not have an exact date. 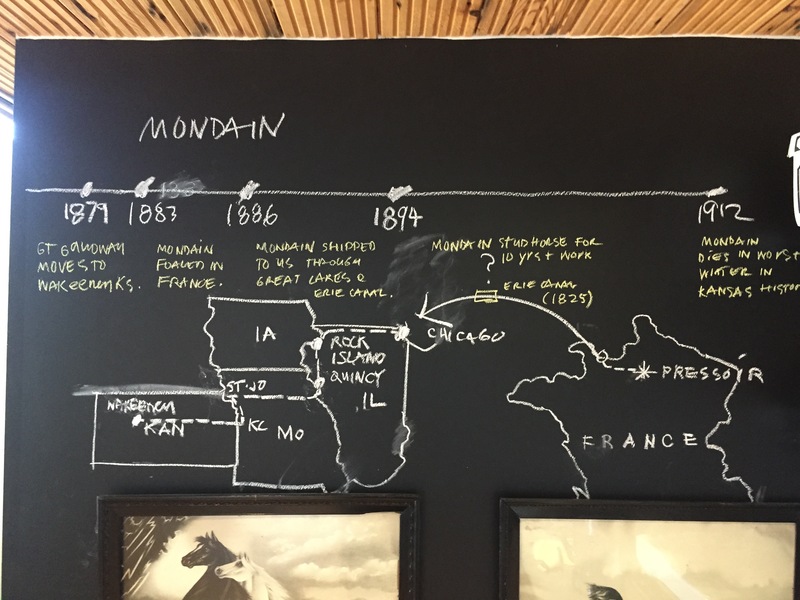 1891 is the date that Mondain started to become listed as a stud for hire in the classified advertisement section of the Western Kansas World from 1891-1894 and other local papers for hire (2,3). MONDAIN. The Imported French Draft Stallion Mondain 6512 in French register and 4151 in American register will stand in Wa-Keeney this season. DESCRIPTION AND PEDIGREE. MONDAIN is a steel grey, 17 hands high, weighs 1,800 pounds, good flat bone, fine style, with high knee action, nice rangy horse; sired by Philbert (795), dam, Nannette (6511), she by Brilliant (755) he by Coco (116, 714) bred by Monsieur Hercelin, residing Pressoir, France. The Terms will be given on handbills. C.R. Towne will have Mondain in charge. George’s middle son Lew Hamilton Galloway was born in 1883, the same year as Mondain. Conservatively assuming that George purchased the horse in early 1891, Lew would have been 8 years old and spent his life growing up on the farm with the horse that he affectionately called “Old Dain”. The horses job at this time on the farm would have required long hours and was the primary source of power for hauling, planting, listing, and harvesting all of the various row crops grown on the farm. In 1912, Mondain would have been 29 years of age, at the end of his time being used as a primary workhorse on the Galloway Ranch. His role as the lead horse has been replaced by a younger Percheron stallion, INCOGNITO. This horse was now the preferred horse stud of choice by George and Lew Galloway, now partners in the ranching and farming business 5 miles north of WaKeeney. 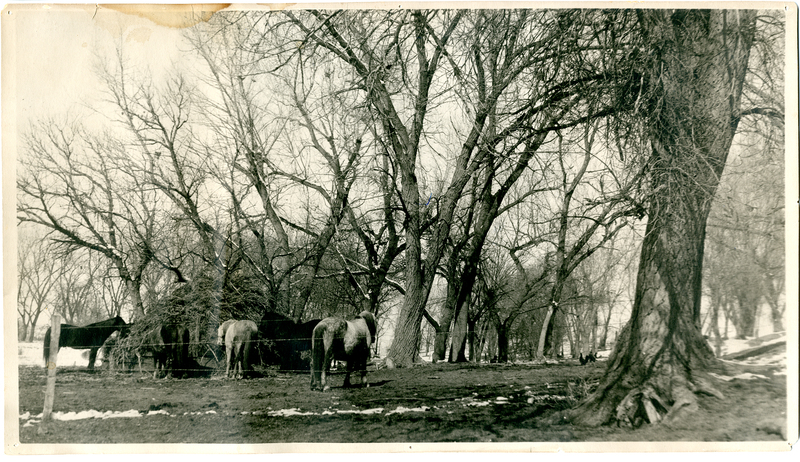 Image left of Incognito at Galloway Ranch, 1916. At right, Lew Galloway with Incognito, 1920’s. 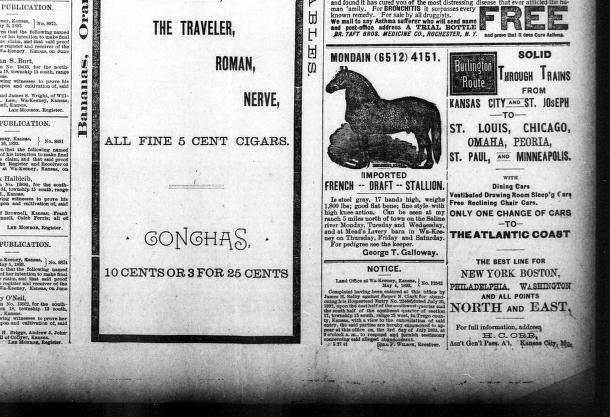 Throughout the entire spring and summer of 1912, George and Lew ran classifieds in the Western Kansas World offering up their prized stallion as stud for hire to local ranchers looking to improve their stock. 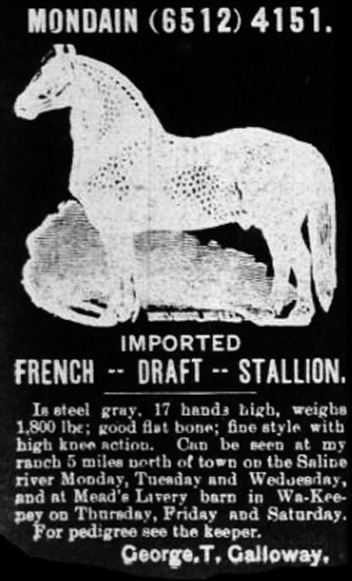 Incognito was foaled around 1907, based upon the information offered up in the advertisement. 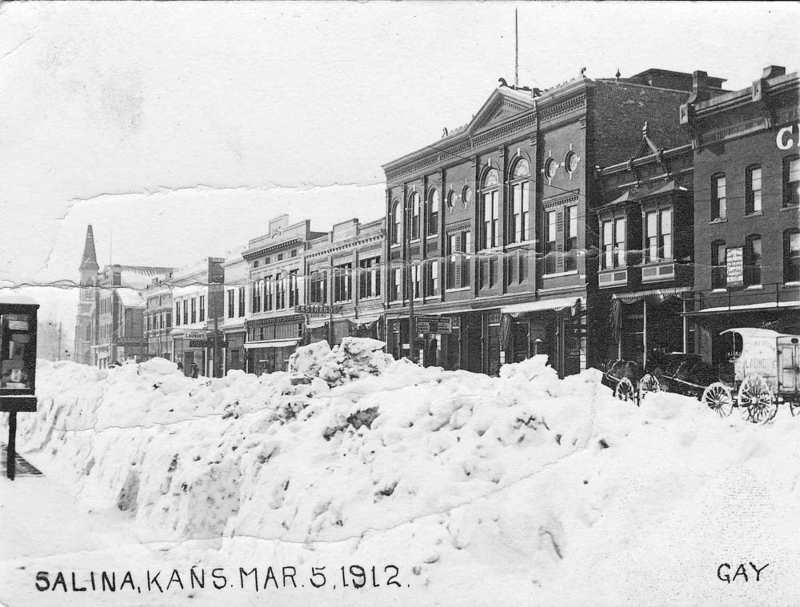 1912 was the year of the worst snowstorm in recorded history in Kansas (4,5,6). 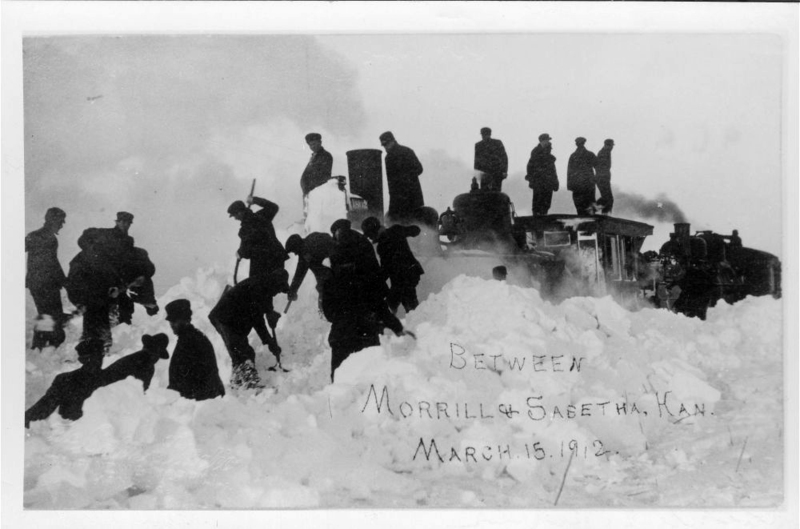 A snowstorm in February and on March 23rd of 1912 dumped more than 3 feet of snow throughout Kansas. 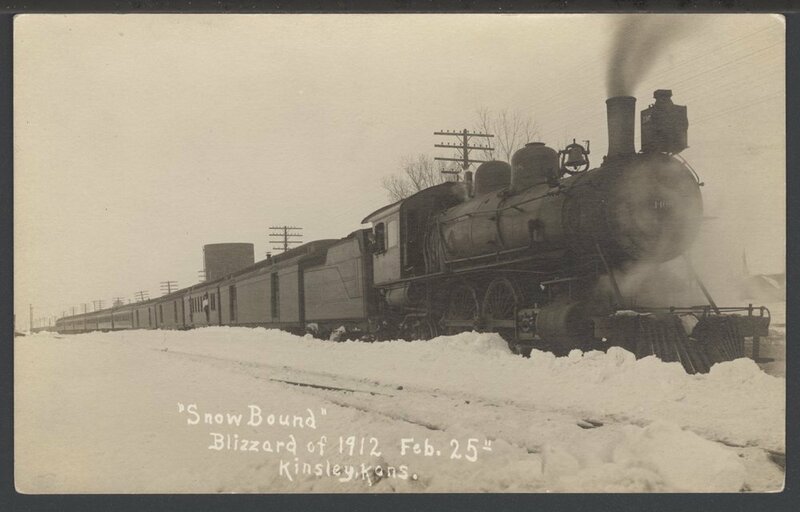 The railroad through Kansas was shut down for more than 4 days in the late March blizzards. 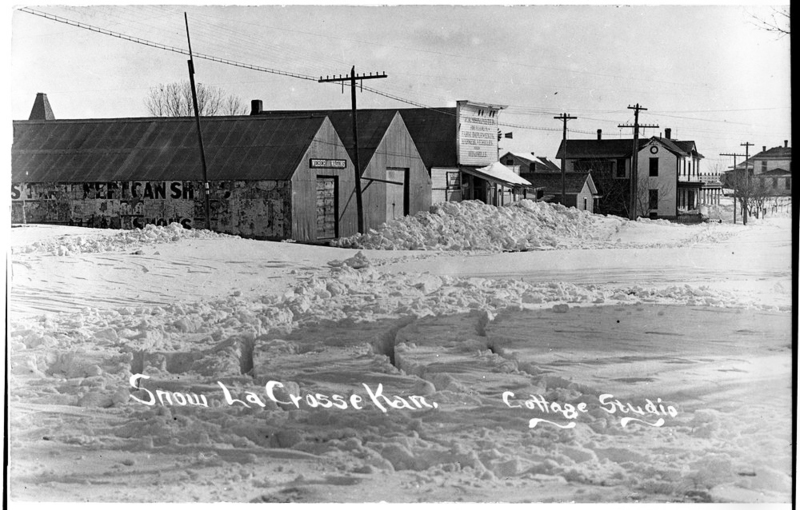 Many livestock were lost throughout Kansas in the snowstorm and the Galloway Ranch was affected as well, as Mondain fell ill during the storm. 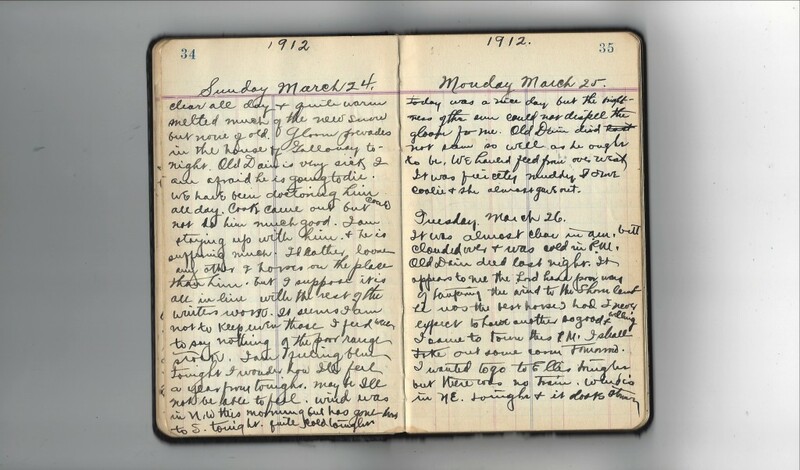 His condition was noted in Lew’s diary from March of 1912. Strong NE. wind all day. Cloudy and cold snowed quite hard all day. Very wet on cattle. Two calves died last night and another cow is down. Today was our unlucky day. We got two loads of alfalfa from H. (Heckman) place and got stuck with both coming home. Then we got a cow down in the mud and a team ran away. Cold and Wet tonight and old Dain is sick. I wanted to go to Ellis but it was too stormy. I wonder when it will ever stop storming. Today was a nice day but the brightness of the sun could not dispel the gloom for me. Old Dain not so well as he ought to be. We hauled feed from over West. It was fiercely muddy and I drove Coalie and she almost gave out. It was almost clear in A.M. but clouded over and was cold in P.M. Old Dain died last night. It appears to me the Lord has a poor way of dampening the wind to the Show land (Cannot trans.) He was the best horse I had I never expect to have another so good and willing. I came to town this P.M. I shall take out some corn tomorrow. I wanted to go to Ellis tonight but there was no train. Wind’s in NE. tonight and it looks stormy. 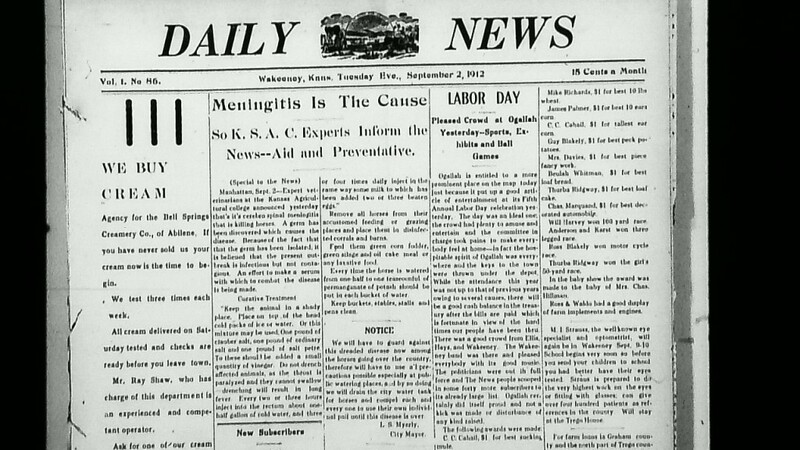 The summer of 1912 was also one of the worst livestock die-offs in the history of Kansas. 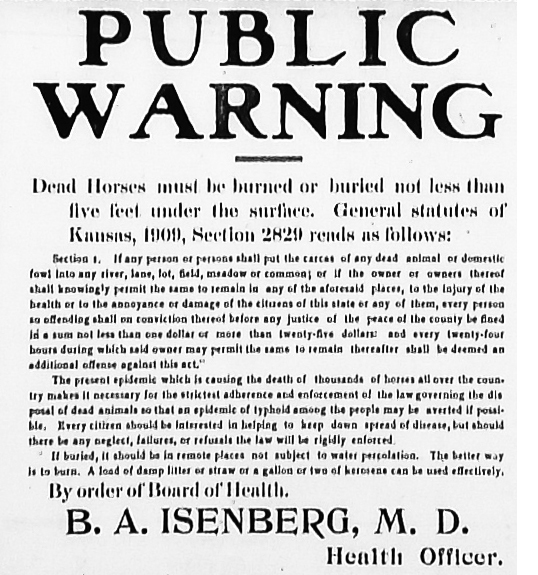 That year a deadly horse meningitis swept through the State of Kansas and many horses died from the disease, or were killed and burned to prevent the disease from spreading to neighboring ranches or communities. There was a burn order in effect for Trego County and more than 20,000 animals perished in Saline County alone. During an preliminary analysis of state Census records for Trego County, Kansas for the years 1905 and 1915, horse numbers in the county were down 25% or more in the 1915 Census compared to 10 years earlier. Because state census are taken every 10 years in the off-interval (1905, 1915, 1925) between Federal Census records (1900, 1910, 1920, etc), this is as accurate as we can get without a more in depth analysis using property tax records from the Trego County Courthouse. 1. National Register of French Draft Horses (Volume 5, by NFDHA, 1888), pages 127 and 157. 3. The Percheron Horse Association of America, The Origin and History of the Percheron. 5. Chronicling America / National Digital Newspaper Program (NDNP), a joint sponsored effort from the US Library of Congress and the National Endowment for the Arts (NEA). 6. Kansas State Historical Society (KSHS), Special Collections Division, microfilm of four (4) newspaper publishers in Trego County, Kansas: The Daily News, The Trego County Reporter, The Short Grass News, and the Western Kansas World. 6. Snowfall statistics from NOAA.